Hi, this is Brent White. 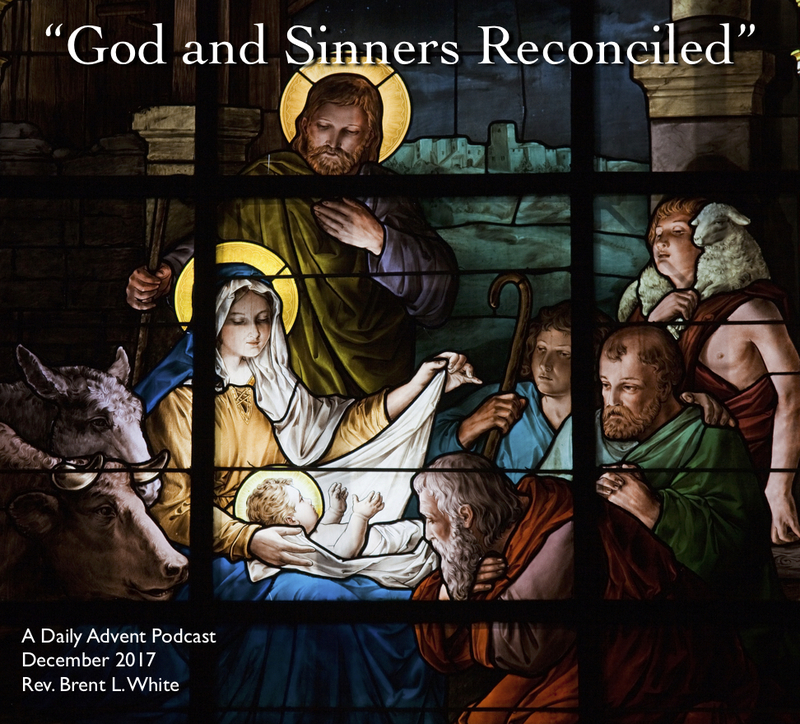 It’s December 19, 2017, and this is Day 17 of my series of Advent podcasts. You’re listening to a 15th- or 16th-century English Christmas carol—sung in the original Latin, no less!—by one of my favorite bands, an English folk rock group called Steeleye Span. Believe it or not, they had a Top 15 hit in Britain in 1972 with this song! A translation would begin, “Rejoice! Rejoice! Christ is born of the Virgin Mary. Rejoice!/ The hour of grace which we seek is here/ We offer with devotion our songs of gladness… God is made man/ A thing of wonder/ The world is renewed by Christ’s reign.” You can look up the rest. Surrendering doesn’t mean asking Jesus for advice on how to live; it doesn’t mean asking him to help us out of a jam every now and then; it doesn’t mean asking him to be our personal assistant; it doesn’t mean asking him to be our life coach. It means he’s in charge. It means that what he wants, he gets. It means that we’re happy to give it to him—because we’re not living for ourselves; we’re living for him. Even as I was asking these questions, I heard laughter in the congregation: Of course we don’t get angry about those things! We get angry when we don’t get our way. When we don’t get the glory for ourselves to which we feel entitled. When our plans get disrupted. We love Mary’s words of surrender in Luke 1:38, yet more often than not we say—through our actions—“Here I am, servant of myself. Let it be to me according to my word.” Because what I say goes. You see, our problem is not just that we live in a broken world and that its brokenness enters our doors; beneath that reality is a much deeper problem. We have a glory problem. We have preferred living for ourselves over living for something and someone bigger than ourselves. In our marriages, in our parenting, in our work, in our friendships, and in the church, we have made life all about us. We have tended to reduce the active field of our concern down to the tiny confines of our wants, our needs, our plans, our satisfaction, and our happiness. It’s not wrong to want some control, or to want to be right, or to like beautiful possessions, or to be surrounded by a community of love, but it’s wrong and spiritually dangerous for those things to rule your heart. He goes on to say that sin has made all of us “glory thieves”: we steal for ourselves the glory that belongs to God alone. And of course this makes us miserable. We simply weren’t created to live for our own glory. Yet I wonder if this sinful desire to glorify myself isn’t my main struggle in life! Twenty-five years ago, my first job out of college was in sales. I was mentored by an older, well-seasoned, and successful salesperson named Alec. He told me more than once that money—of which he had plenty—wasn’t a big motivator for his success: “I want recognition,” he said. Given my own modest commission checks at the time, I thought that was insane. Now, however, I totally know what he means. Unfortunately. Oh how desperately I crave “recognition”! God help me, I am a glory thief! Well, I’m 47 now, so how did that turn out? Since I recognized that I was a glory thief about seven or eight years ago and began making faltering attempts at repentance, God, out of his great mercy, has frequently disciplined me—often using circumstances in my life to keep my pride in check… well, more like stomping my ego flat. It re-inflates very easily, but maybe I’m a little less “puffed up” each time. In our Wesleyan tradition, we have a prayer that we often pray—especially during this time of year—called the Wesleyan Covenant Prayer. It used to be featured in Methodist “Watch Night” services on New Year’s Eve. Most Methodist churches don’t have Watch Night services anymore, but the prayer remains, and it’s a good one. If we could only live it out, it would kill the glory thief within. 1. Paul David Tripp, Come, Let Us Adore Him (Wheaton, IL: Crossway, 2017), 46. This entry was posted on	December 19, 2017 at 10:17 am	and is filed under Uncategorized. Too many Christians see their relationship with God as, “What can God do for me?” They pray for protection, health, prosperity, peace of mind, and so on. They don’t pray that God call them out, use them, and bless others through them. I like the story of Mother Teresa, that when she was old and infirm the younger Sisters implored her to slow down and not go out into the streets to help the poor and sick so much, saying that she had done enough. She replied, “I must. God hasn’t yet finished emptying me”. I like it. Thanks, Grant. Very good post! I suffer from being a “glory thief” as well. If I write a letter to the editor, it very well should get published, doggonit! A good reminder. I’m with you. I’ll never get enough of what I need if I think I need praise, recognition, and attention of others.